If you ever took a look at my Instagram account, it’s pretty clear that I have a strong love affair going with coffee. 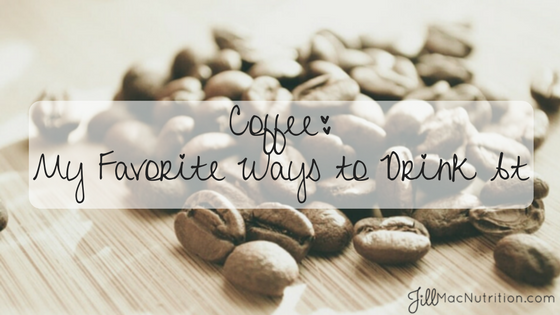 I love coffee so many ways, for so many reasons. I gave up coffee twice in my life, and both times I actually felt depressed and sad. I love coffee for giving me energy, making me happy, helping me go to the bathroom, and because it is so damn delicious. During the summer, I am strictly an iced coffee or cold brew over ice girl. I blend all that together in a blender and then pour over ice and enjoy with a straw! 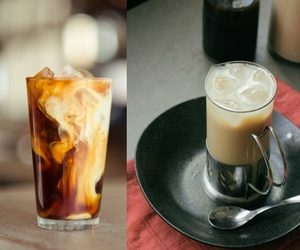 If I get an iced coffee out at a coffee shop, I’ll either get a black iced coffee with a flavor (usually vanilla) or if they have coconut or almond milk I will put that in as well. However, I don’t really care for the taste of almond milk in coffee; I prefer coconut milk. When fall rolls around, I go all out with pumpkin spice everything, and start drinking hot coffee again. I add all ingredients to a blender for 30 seconds. I also have this Pumpkin Spice Coffee recipe that I will treat myself to sometimes in the fall. And I do like to go to Starbucks once or twice a season and get my Pumpkin Spice Latte with coconut milk. And sometimes I’ll grab just a plain coconut milk hot latte from Starbucks or other coffee shops that offer coconut milk. After pumpkin season, I make myself a Gingerbread Coffee during the month of December. And then for the rest of the winter, until it becomes iced coffee season again, I’ll usually have a hot vanilla coffee and/or latte with coconut milk. I tend to drink a lot more coffee during the winter than I do in the summer. I believe it is because the cold weather leaves me depressed and drained of energy. Coffee is what gets me through those days… I really need to move to a warm weather state. So there you have it. I love me my coffee and I love it many different ways. It’s a ritual, a routine, a tradition, and a way of life for me. How do you like your coffee? Or are you more of a tea person? Leave it in the comments!